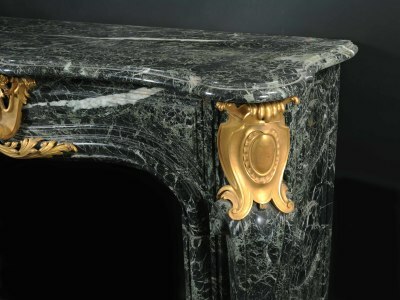 A palatial Louis XV gilt-bronze mounted marble fireplace. 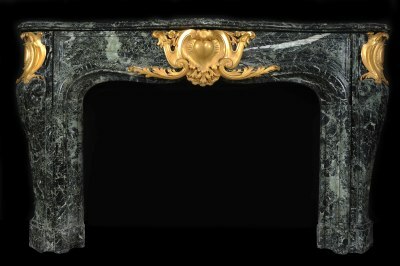 This rare and impressive Green Alps marble fireplace features a shaped lintel centering on a mercury-gilt bronze heart-shaped mount, issuing sun rays, scrolling acanthus leaves and flowers. 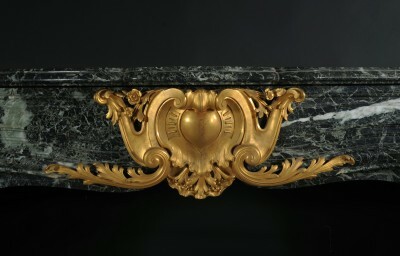 The S-shaped jambs, also mounted with gilt bronze cartouches, are raised on a stepped base.